Highlights include the famous operetta Al-Leila Al-Kebira (with lyrics by Salah Jahine and music by Sayed Mekkawi, two great figures of the 1960s) at the Talaat Harb Creativity Centre; religious chanting and Samaa group performances featuring star sheikhs Mahmoud Al-Tuhami and Amer Al-Tuni as well as Tanoura Whirling Dervishes performances at the Al-Ghouri complex, directed by Intisar Abdel Fatah; and a performance by the Busairi Burda group, founded in honour of the great Sufi poem in praise of the Prophet Muhammad (written by the 13th-century Shadhili dervish whom the Prophet cured of paralysis in a dream) at Beit Al-Suheimy in Al-Azhar. At the Children’s Creativity Centre, under the title “Nourak Ya Ramadan” (or “Your Light, Ramadan”), ceramic, puppet and fanoos Ramadan making workshops will take place, as well as puppet and shadow puppet performances, concerts and storytelling. The House of Egyptian Architecture will host a series of cultural salons discussing art, music and architecture topics, while the Centre for Artistic Creativity on the Opera House grounds, directed by Khaled Galal, will present Galal’s latest play, Sallem Nafsak (or “Surrender”), a tragicomedy performed by centre trainees. Harpist Manal Mohi Al-Din will be among the virtuosos to perform in Alexandria. According to Head of the Culture Palaces Ahmed Awwad, a programme of plays organised in collaboration with the Theatre Art House will focus on such topics as terrorism and unemployment; the Palaces will also present poetry readings and exhibitions. 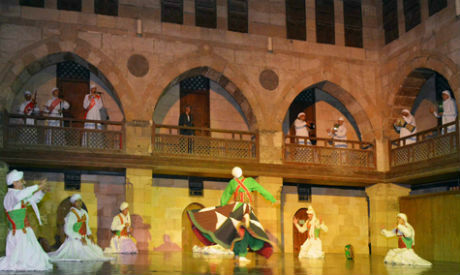 For his part Cairo Opera House Chairman Magdi Al-Ansari says there will be 42 events to “emphasise the role of the Cairo Opera House as a beacon of soft power” in the course of Ramadan. These include folk music and dance from Indonesia, Tunisia, Palestine, Sudan, Bosnia and Herzegovina – Islamic countries – at the Small Hall and Open-air Theatre, as well as a celebration of the 100th anniversary of Armenian independence and 16 Arabic music concerts featuring, among others, pop star Medhat Saleh, Syrian Sufi group of Abu Sheir Brothers and marimba player Nesma Abdel Aziz. As for the Ministry of Antiquities, it is organising a special show on the history of the fanoos or lantern at the Egyptian Museum pergola. Museum director Sabah Abdel-Razek explained that the show will go back to ancient times, presenting arts and crafts techniques through the ages. The Museum of Islamic Art too is organising workshops lead by artist Marwa Abul-Dahab.